Cosmetological properties of pine nut oil produced by the original cold-pressing technology on wooden presses. Pine nut oil produced under the trademark "Siberian Pine Nut Oil" is a biologically active product when used in cosmetic facial and body massage, helping the skin carry out its functions and also restoring its esthetic properties. This occurs thanks to its inclusion of large quantities of vitamins, macro and micro elements, saturated and unsaturated fatty acids in their original natural concentration without additional carriers, fillers, concentrates or flavoring agents. The highly curative properties of "Siberian Pine Nut Oil" pine nut oil are explained by the technology of preparation, which includes a method of cold-pressing and the gathering of cedar nuts by hand, allowing the product to retain all the great revitalizing strength of the cedar tree. Because of the absence of animal fats, the large concentration of fatty acids in the external application of the oil, creates a thin, protective lodicule preventing the penetration of environmental microorganisms, dust and chemical substances from the surface of the skin into its deep layers. The fatty acids, being a poor conductor of heat and a good thermal insolent, help the skin conserve heat, reduce heat loss and thus serve to warm up the skin to some degree. This removes cramps from the skin’s capillaries and constantly facilitates a full exchange of substances — i.e., it protects the skin from shifts in air temperature, as when one goes outdoors, for example. This effect is compounded by the resultant retention of water in the skin cells and its transudation in intercellular space. Water saturation makes the fibro cartilaginous elements of the skin elastic and resilient. The intensified blood circulation resulting from capillary expansion, the fact that the oil contains a large quantity of vitamins along with macro and micro elements, supports a high level of substance exchange and stamina in the cells, slowing down the ageing process and the accumulation in them of reduced-acid products. 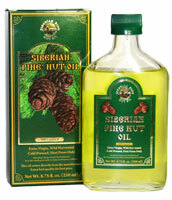 In addition, thanks to its salutary effects — maintenance of the skin’s temperature régime, high-quality nourishment, active blood circulation and the transudation of liquid, including from subcutaneous fat, "Siberian Pine Nut Oil" pine nut oil has a strong anti-cellulite effect (subcutaneous fat is a deep layer of the skin). The effectiveness of all the above-mentioned processes which take place either on the surface of the skin or its subcutaneous layers is due in good part to the absence of animal fats in the oil, which allows the skin to keep its pores open and fully maintain all its natural functions. On the basis of my own experience with practical application of "Siberian Pine Nut Oil" pine nut oil over a period of three years, both as a massage oil for the body and in cosmetic facial massage, as well as my practical comparative analysis of other natural plant oils used for this purpose, I can say that this pine nut oil has a strong remedial effect on the human body — for not only the cure but also the prevention of many ailments. I recommend "Siberian Pine Nut Oil" pine nut oil for the prevention of the following diseases: dermatitis, nitrogenous dermatitis, seborrheal dermatitis, various skin diseases, stomatitis, psoriasis, longstanding wounds, ulcers; also vessel atherosclerosis — for both prevention and cure of cholesterol exchange disorders; arterial tension, atherosclerosis, cramps in peripheral vessels, hypotrophy, dermatosclerosis, hypertonic disease, blood diseases and myocardosis. In the case of serious or aggravated diseases, before taking the pine nut oil please consult your physician.